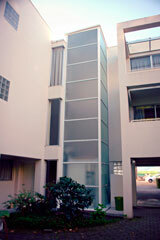 Access Solutions has installed numerous residential lifts. Whether it is for a new home or an existing building, we aim to meet all your needs. Listed below are several of our completed projects. This job featured a totally customised glass lift with a super clear glass floor, providing an amazing experience for the client and visitors. Customised, minimalist sills and frameless glass doors from floor to ceiling eliminated any unnecessary visual intrusion. This lift was housed in a glass shaft overlooking the Derwent River in Battery Point, Tasmania, in one of the most exclusive homes ever built in the state. 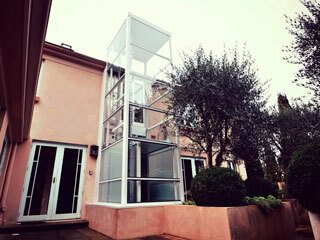 This domestic lift was designed as a feature to the house frontage. Specialised floor-to-ceiling glass doors and walls included a photographic interlayer to match the existing slumped glass panels (which were custom-made and irreplaceable). The lift car featured a glass floor and polished stainless ceiling, and the shaft was detailed to a very high standard with concealed wiring to all buttons. Timber sills added a rare touch of warmth to this stunning feature project. This was a truly special opportunity to provide our top of the range glass lift and auto doors into a luxurious environment. 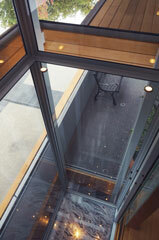 The manicured garden was incorporated into the design features supplied by Access Solutions and the lift built to suit. All internal finishes were completely hand finished, the lift floor tiled with marble and the external walls rendered to match the original. Three phase power was provided as an upgrade incorporated into the project. This project required concealed access to the residence beside the carport, providing a more convenient path especially in inclement weather. The lift was incorporated into the structure of the rear external veranda and walls, giving the appearance of original construction. Custom joinery, integrated book shelves and a polished mirror stainless steel rear wall completed the details. The external shaft was clad and rendered and was accommodated within the existing roof line. Working together with architects, engineers and designers, Access Solutions installed this highly customised lift in one of Hobart's most exclusive streets and made the owner's requests a reality. The house is absolute waterfront, featuring convict brick and large glass windows, and the architects we engaged made terrific suggestions to accommodate the external fabric of the lift shaft into the existing building and eliminate the "added on" look. Rock blasting was employed to remove rock which directly supported the existing house - but not a crack or broken window was seen due to the safety measures employed by Access Solutions, despite tremors being felt 40 metres away! The car interior was fitted out using two-pack panels in high gloss, the parquetry floor seamlessly matched and polished concrete floors utilised in the lift pit. Double glazed windows were used in the shaft to provide ambient light to a dark area. 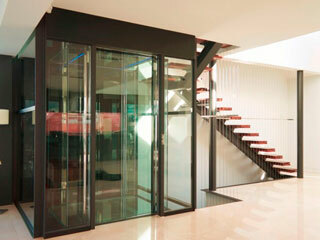 The frameless glass doors, glass walls and floor were combined with a polished stainless steel frame. Careful planning and acute attention to all details produced a result that is one of a kind. This installation was sponsored by the Department of Veterans' Affairs over a five year period. Another turnkey project from start to finish, an elegant designer house on the waterfront required three separate stops with security access and building works. Floor to ceiling glass walls were adjusted to make way for lift entrances and discreet glass block screen walls were installed for privacy. Tiled entrances and three phase power were also installed. Each level was independently owned with specific requirements, which were accommodated through open dialogue and communication with each tenant. 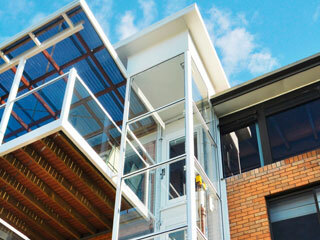 A three stop external lift with access from the rear of the house to all three living areas. Minimalist design, a full glass shaft and car walls took advantage of the location overlooking the Bellerive Bluff and Derwent River and enabled the users to enjoy the views whilst using the lift. To assist the builder, Access Solutions undertook the building of the concrete pit and foundations of the lift shaft.